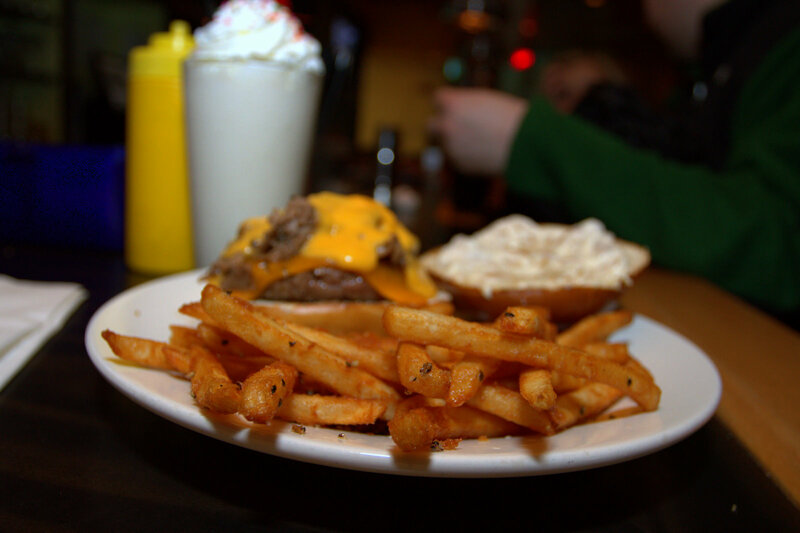 PYT Philly is a local hamburger joint located at The Piazza in Philadelphia, PA. It’s open late and doubles as a bar/lounge where you can often find a DJ spinning on the weekends. A couple months back I was traveling to a trade show in Atlantic City and I decided to fly into the PHL airport in Pennsylvania and drive into AC for the show. I couldn’t get any Atlantic City burger recommendations on Twitter, but I got several recommendations for places in Philly to check out. I also happened to be following @pytphilly on Twitter and I had seen a few posts about the different crazy burger combinations they had there…so I knew that would be my first stop. They even took the time to suggest a burger for an out-of-towner like me to try on my first visit. Not to get all Snoopy-esque, but my first trip to Philadelphia was truly a “dark and stormy night”. I might go as far as to call the rain downpour level: torrential. My flight got in at about 12:00 AM in the morning and I had the bright idea of renting a car (at night, in the pouring rain, in a city I’ve never been to before) to squeeze in a burger adventure before I made the drive to my hotel in Atlantic City. As I waited for my burger to be cooked, I took a seat at the bar and got myself situated. Again, this was my first time to Philadelphia and although the crowd looked nice enough, I wasn’t sure if this was the kind of neighborhood where you pull out your DSLR camera and start snapping photos. I started with a few, no flash shots to check the lighting, and then struck up a conversation with the lady next to me at the bar who noticed my camera. Turns out she was attending a local culinary school and she dropped a few cool Philly restaurant recommendations for me to check out. 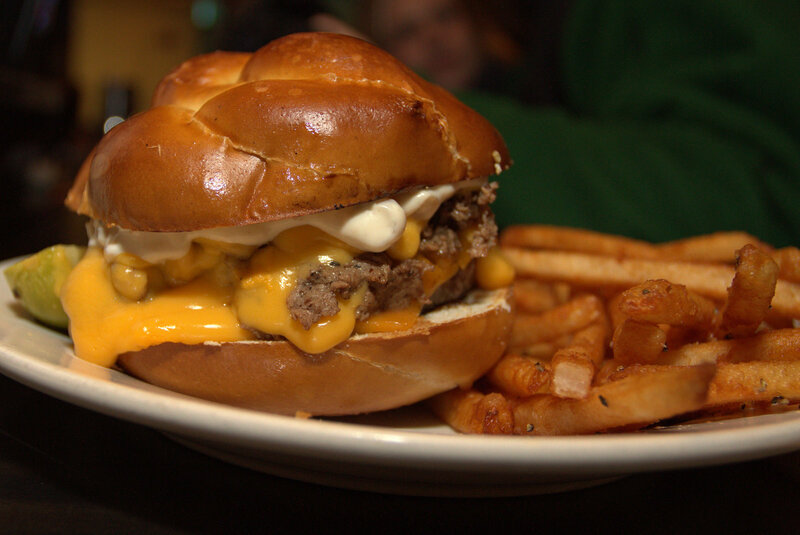 When the burger arrived, the first thing I noticed was the glistening pretzel bun. 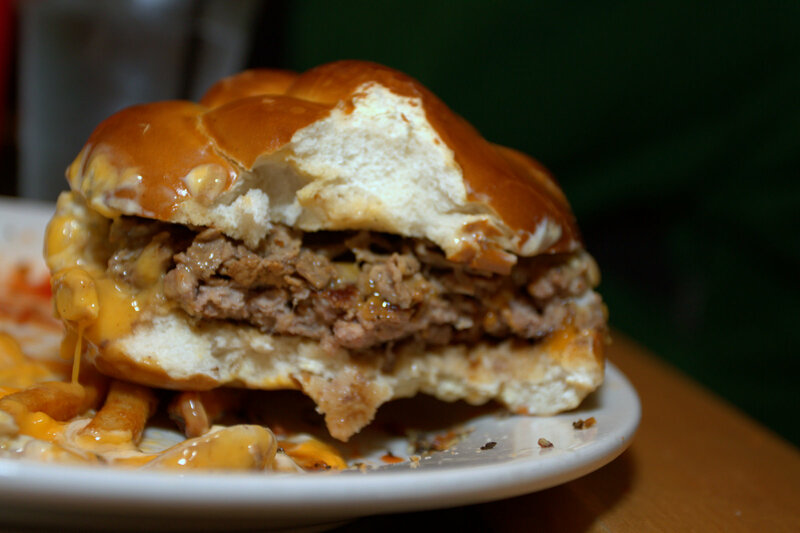 I love soft, salty pretzels and the way this bun hugged its hamburger insides made me tempted to skip the photos and just pounce on the meal…much like a starved lion must view a gazelle after a long day of travel. The bun delivered on the saltiness I imagined a pretzel bun would have, but I’m guessing since I was the last burger customer of the night, the bread wasn’t as soft as it could’ve been earlier in the day. It was actually a bit tough to bite through to get to the meat of the sandwich. The burger itself was delicious. Cooked to a nice medium, every inch of it was smothered in tangy cheddar cheese and gooey cheese wiz (just like a traditional Philly Cheesesteak). Most my burgers have bacon as the added meat topping, but the thinly sliced steak was a nice change-up and made the burger extra hearty. The sides at PYT Philly are worth noting. I could have eaten 3 helpings on the fries that came on the side of the burger and you know a place is good when it has “Adult Milkshakes” on the menu. They even had a “Jack Rabbit Slim” milkshake which earned them a few extra B factor points for throwing a Pulp Fiction reference on the menu. I’m usually a chocolate shake kind of guy, but this time I went with the ?uestlove (@questlove) milkshake which had vanilla ice cream, frangelico and irish cream liqueur. Man, was this shake rockin’! Smooth and creamy from the vanilla and irish cream with just a hint of warmth from the liqueurs! I hope you enjoyed my tale of a dedicated burger junkie! On my next trip to Philadelphia, I’ll definitely hit up PYT Philly again. I’d probably come earlier in the daytime so I can see where I’m driving (and so the buns will be fresher). This is one of those places where I’d come back just for the sides. 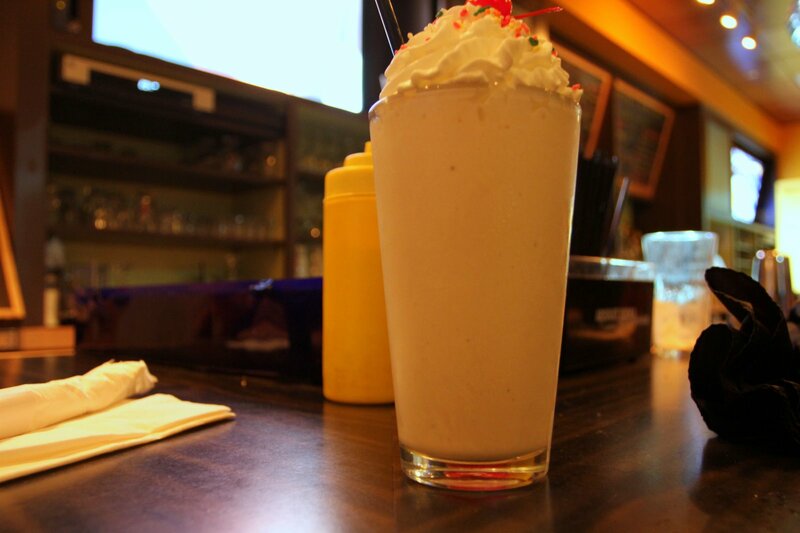 Who couldn’t pass up and adult milkshake, some tasty fries and good music on a Friday night? PYT comes up with some seasonal burger specials like their Krispy Kreme Burger that I’ve gotta try. Sound off in our burger forums! 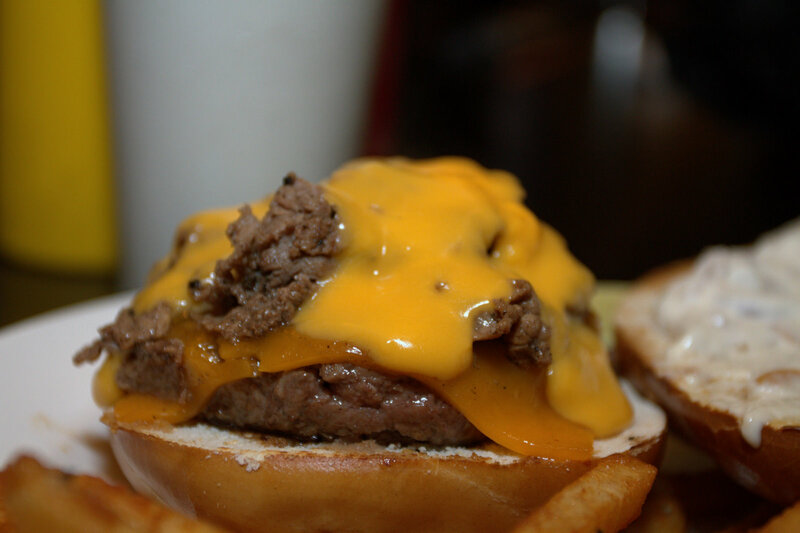 What’s your favorite burger joint in Philadelphia?